Gradient coil design typically involves optimisation of current densities or coil windings on familiar cylindrical, planar, spherical or conical surfaces. 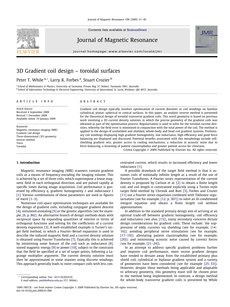 In this paper, an analytic inverse method is presented for the theoretical design of toroidal transverse gradient coils. This novel geometry is based on previous work involving a 3D current density solution, in which the precise geometry of the gradient coils was obtained as part of the optimisation process. Regularisation is used to solve for the toroidal current densities, whereby the field error is minimised in conjunction with the total power of the coil. The method is applied to the design of unshielded and shielded, whole-body and head coil gradient systems. Preliminary coil windings displaying high gradient homogeneity, low inductance, high efficiency and good force balancing are displayed and discussed. Potential benefits associated with this morphology include selfshielding gradient sets, greater access to cooling mechanisms, a reduction in acoustic noise due to force-balancing, a lessening of patient claustrophobia and greater patient access for clinicians.